I have one of these and absolutely love it! 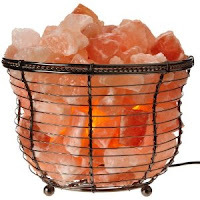 Right now at Amazon, you can get a Natural Himalayan Basket Salt Lamp with Bulb and Dimmer Switch for only $20! This has a list price of $49.95 and ships for FREE with Prime or a $25 order. (click here for a free 30-day trial of Prime) This particular lamp has tons of rave reviews! 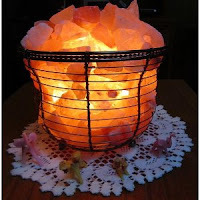 The chunks are made of natural salt crystal from the Himalayan mountains and they work as an air purifier by emitting negative ions into the air and light therapy to reduce stress and increase energy. NOTE: You can also get a smaller, tealight sized candle for $11.11 here.